In one sentence, you should invest 20-30% of your savings in Gold for sure. You must be thinking why, let me tell you then. Price of the gold grew 236% in last 5 years so if you bought some gold for Rs.10,000/- in Sept 2007 then it can be sold for Rs.33,600/- today. In general the cost of Gold is rising in all the countries of the world. 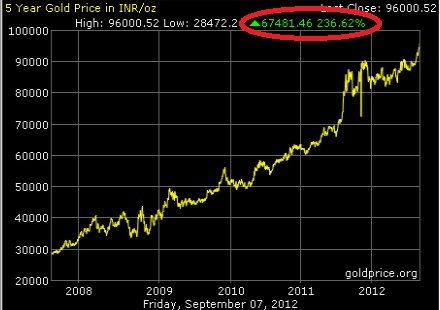 Even RBI is investing in gold, it bought 200 tonnes of gold in 2009. Demand of gold in India is less likely to diminish, Indians will always gift their daughters some gold during the marriage which creates 60-70% of the total demand. We import about $60 billion worth of gold every year and we hardly produce any so you can calculate the demand yourself. The smartest of all, the bankers could see the trade profit and started selling this yellow metal. I will prefer to go for SBI gold compared to all. If you are looking it as an investment then buy the bars where you will hardly pay the making charge which costs the max. I guess it starts from 100 gms. If you are in a mixed-up mind then go for any jewelry that you like but try to get it from a reliable jeweler and it should be a 22 kt gold.